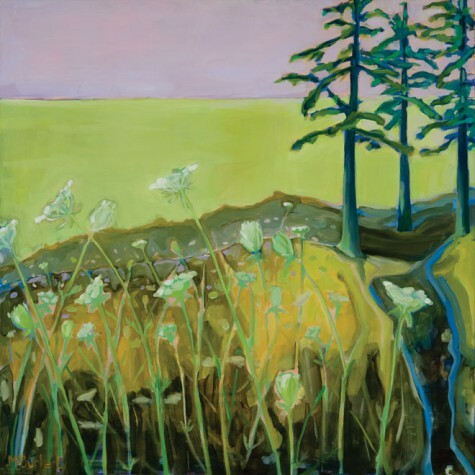 Melting Snow, 2011, oil on linen, 6" x 6"
Queen Anne's Lace, 2011, oil on canvas, 36" x 36"
Dooryard View, 2010, oil on Masonite, 16" x 20"
Lois Dodd, Martha Burkert, and Jacobus Baas are largely landscape painters who simplify and condense what they see into refined, energetic compositions. Additionally, Dodd looks for geometric shapes, Burkert takes great liberties with local colors, and Baas reduces descriptive brushwork. In this particular selection of images, the artists reflect on the seasonal transition into winter. 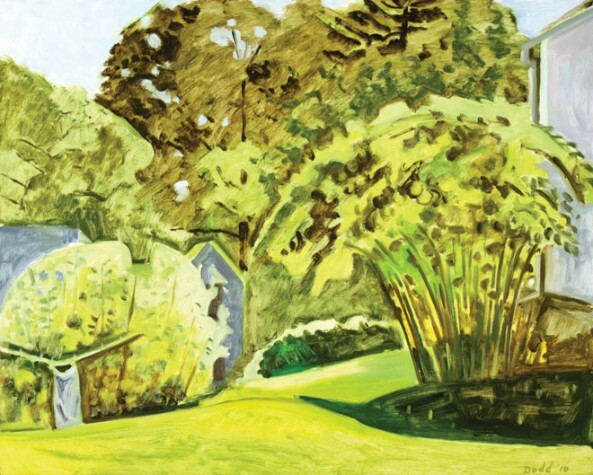 Lois Dodd easily qualifies as the doyenne of American landscape painting. Born in Montclair, New Jersey, she attended the Cooper Union in New York City. She has received numerous grants and awards from highly prestigious institutions, including the American Academy of Arts and Letters and the National Academy of Design. Dodd has had several solo museum exhibitions, including shows at the Bowdoin College Museum of Art, the Montclair Art Museum, and the Farnsworth Art Museum. A recent retrospective at the Kemper Museum of Contemporary Art in Kansas City, Missouri, is accompanied by a major publication and will travel to the Portland Museum of Art in early 2013. Dodd’s work is at the Portland Museum of Art, the National Academy of Design, and the Smithsonian Cooper-Hewitt, National Design Museum, among many other well-respected museums. Dodd divides her time among New York, New Jersey, and Cushing, Maine. She is represented by the Alexandre Gallery in New York City and the Caldbeck Gallery in Rockland. Because Lois Dodd works from direct observation under any weather or light conditions, even at night, she has to paint relatively quickly and simply, abstracting what she sees. The artist has a superbly honed eye for surprising subject matter and subtle interactions of colors and shapes, which she captures in dynamic compositions. Her paintings thus may not depict traditionally beautiful views, but Dodd elevates even window latches and sheets on a clothesline to exquisitely conceived masterpieces. Her paintings exhibit a breathtaking boldness and an assuredness in simplification. The artist’s goal is to capture how a landscape or interior scene feels to her, paring it down to essentials in the process. Dodd has absorbed the lessons of all major painting innovations since modernism, and she has made them her own, steadfastly working in a representational manner. 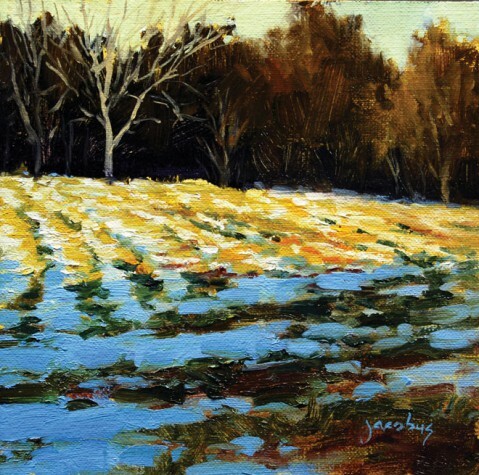 The locales of her paintings and their subject matter reflect Dodd’s seasonal peregrinations. Finding her subjects in the everyday, she often revisits an object, garden location, or particular view many times. Using linen, Masonite, and small sheets of aluminum as supports, the artist deploys extremely thinned paint. “In some cases, it’s just barely colored drawing,” Dodd says. Each painting’s palette is reduced to just a few colors and their variations to create an enticing harmony that draws her paintings away from naturalism. 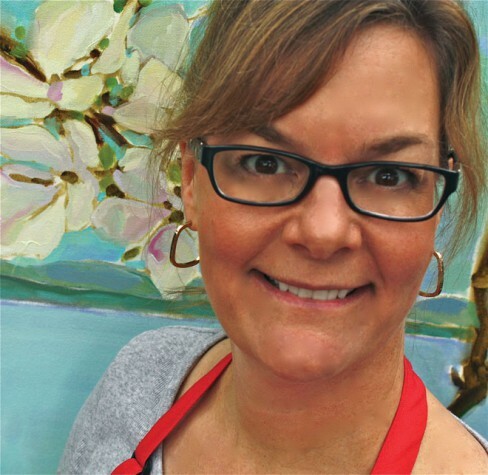 Martha Burkert grew up in Texas and received a BA in English from Tulane University in New Orleans. She took studio classes at the Maine College of Art in Portland and the University of North Texas in Denton. Burkert was invited to an artists’ retreat at Maine Audubon’s Borestone Mountain Sanctuary in Monson in 2008, and she has exhibited widely at galleries in Maine and Texas. The artist now divides her time between Dallas and Yarmouth. She is represented by the Elizabeth Moss Galleries in Falmouth. Martha Burkert was compelled by the beauty of Maine to learn the technical skills needed to capture it. While she has been painting only since 2000, the artist already had a keen sense of design—she was a location scout and photo stylist for Thos. Moser and for home-furnishing catalogs. Burkert’s mature work shows the influence of some of Maine’s best colorists, including Fairfield Porter (1907–1975) and Alfred Cheney Chadbourn (1921–1998), who worked representationally but leaned toward abstraction. Burkert often creates small paintings and oil sketches on-site. Additionally, she takes photographs in black-and-white instead of color because the chromatic range is too limited for her needs. Yet all these direct responses to nature only serve as references and jumping-off points. In the larger paintings she executes in her studio, paint application, color resonance, temperatures, and commanding shapes become the artist’s focal points. “The bigger the canvas, the more I push color and form in a more exaggerated direction,” Burkert says. Complex landscapes are often arranged into a repoussoir of more detailed flowers or trees in the immediate foreground, with expansive planes of loosely painted color in the background suggestive of the sea, clouds, or other major landscape formations. In Queen Anne’s Lace, Burkert evinces the liberties she takes with naturalistic representation, and water and sky have turned into bands of yellow and pink. The artist often experiments with color combinations until they feel right to her—an emotional and intuitive process that the artist confesses she doesn’t fully understand. Growing up surrounded by the landscapes of Texas, Burkert appreciates the beauty of vast unfilled spaces. 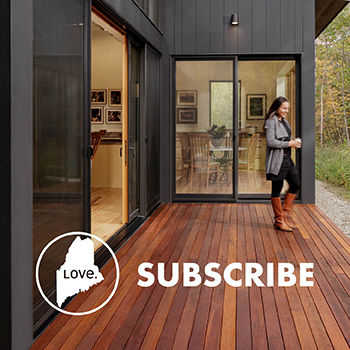 Maine’s landscapes, on the other hand, are more visually complex and seasonally changeable. The artist therefore likes to distill her paintings to their basic elements. “There is a beauty in simple things,” she says. Born in the Netherlands, Jacobus Baas came to the United States at age 12. He is an essentially self-taught artist who has won numerous awards in Hawaii and California for his plein air paintings. Baas is a founding board member of the Laguna Plein Air Painters Association in California, and in 2011 he was chosen by the Maine Arts Commission to show his paintings throughout the Capitol Complex for their Arts in the Capitol program. 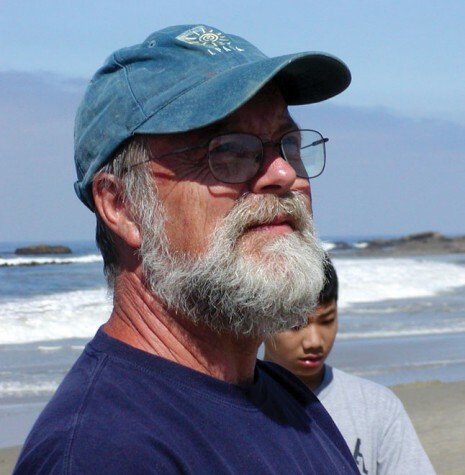 Baas divides his time among his homes in Maine, California, and Hawaii. He is represented by the Dowling Walsh Gallery in Rockland, the Pacific Edge Gallery in Laguna Beach, and in Hawaii by Baik Designs in Honolulu and the Village Galleries Maui in Lahaina. While Jacobus Baas has always felt drawn to paint, he initially designed and created jewelry to establish himself. Starting in 1978, he pursued both creative directions for a while, but he is now totally immersed in painting, especially since he discovered plein air painting in 1994. “It was like a new world!” the artist says. Baas is always searching for what he considers “natural beauty that people might miss in their rush through everyday life,” paying particular attention to how light strikes surfaces. His compositions are condensed into just a few elements, imbuing the images with a sense of serenity. 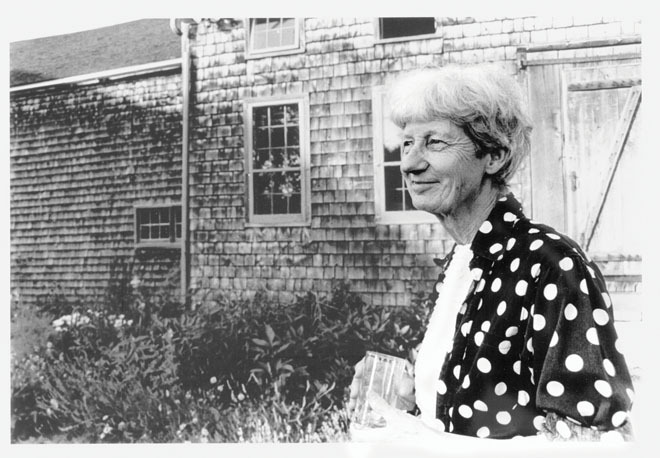 Baas’s paintings of Maine do not necessarily depict typically beautiful subject matter; instead, the artist may paint an old barn with an oil drum out front. Houses and other buildings are kept relatively nondescript and read more like geometric shapes. Baas’s brushwork too seems to abbreviate nature into feathery forms.